The beautiful and unique suspended front fork M5 Mono Shock® or M5 Duo Shock® is combined to wonderful effect with hydraulic rear suspension. 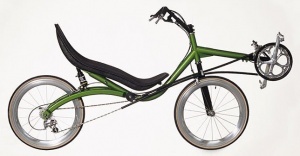 Its speed is enhanced by the small seat angle (adjustable) and the use of genuine 18-spoke M5 Aerowheels. The handlebar is adjustable in four different styles to provide you with the perfect fit. This bike is the perfect answer to the need for a comfortable and convenient bike almost as fast as the M5 Low Racer. When you're using it to zip into town, it's probably even faster! Wheels 18 spoke aero rims. Optional: 36 spoke.